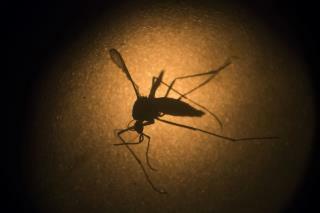 (Newser) – Florida's governor has announced four new cases of Zika virus infection that health officials believe were spread by mosquitoes in a Miami neighborhood, the AP reports. Florida now has 21 people who contracted the virus locally. According to a statement Tuesday from Gov. Rick Scott's office, the Florida Department of Health still believes active transmissions are only happening within a 1-square-mile area in Miami's Wynwood arts district. Hillary Clinton, who visited Miami on Tuesday, is calling on Congress to immediately return to Washington to pass legislation to provide emergency funding for Zika testing, treatment, and research. Millions have died because of the banning of DDT. How many people have been killed by DDT? We sprayed it everywhere when I was a kid. I did grow an extra head and 2 extra legs but they seem to be healthy. Pregnant women have a serious problem and inflected men could pass it on to wives/girlfriends. But other than that, what is the impact. My research shows nothing is known about long term impacts. This is not Ebola, yet the hype is overwhelming. Why don't we simply poison the Florida Mosquitos until the population is down to a safe level.... And then hold the Mosquito population there.. Until a REAL solution is available "Like a Vaccine".. Unless that sounds too SENSIBLE like a Trump plan for terrorist control..